In the church today there is much controversy as to WHEN the rapture of the church will take place. What I mean by this is that some argue that the rapture of the church will take place BEFORE the time of GREAT TRIBULATION, while other argue that the rapture of the church will not occur until the MIDDLE of the great tribulation, and yet others maintain that the rapture of the church will not take place until AFTER the time of great tribulation. So which teaching is the TRUTH? Will the rapture take place BEFORE the time of great tribulation? This is called a pre-tribulation rapture. Will the rapture of the church take place in the MIDDLE of the time of tribulation? This is called the mid-tribulation rapture. 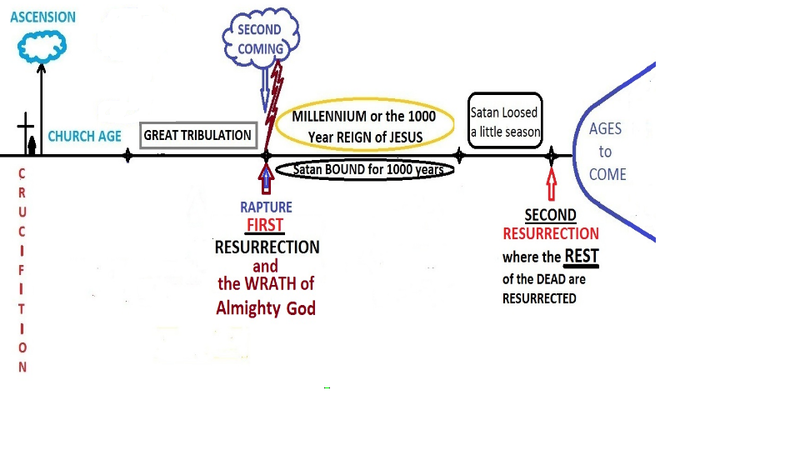 Or will the rapture of the church take place AFTER the time of great tribulation? This is called the post tribulation rapture. Now for me there is no need for all this controversy seeing that the word of TRUTH clearly teaches us as to WHEN the rapture of the church will take place. For example the Bible clearly and plainly teaches us that at the TIME of the rapture of the church there will be the sounding of a TRUMPET. Please read 1 Thessalonians 4:13-18, which is the main passage of scripture that teaches us the event that has been come to be called the RAPTURE of the church. 15. For this we say unto you by the word of the Lord, that we which are alive and remain unto the coming of the Lord shall not prevent (or go before) them which are asleep. 18. Wherefore comfort one another with these words." It is in verse 17 where we get the teaching of the RAPTURE of the church. Now the word "rapture" is not actually found any where in the Bible, but this word "rapture" simply means to catch away. Or in other words, the dead in Christ who have just been resurrected from the dead and all the faithful believers in Jesus Christ who are yet alive at the COMING of Jesus shall be CAUGHT UP or RAPTURED along with the dead in Christ. In other words, we who have remained alive and who are found to be faithful at the COMING of Jesus will be caught up TOGETHER with the dead in Christ who have just been resurrected from the dead. So then, three things happen AT the time of the rapture of the church. First of all there is a sounding of the TRUMP or the TRUMPET of God. Then there is a RESURRECTION of only the dead in Jesus Christ. Then there is a CATCHING UP of BOTH the newly resurrected dead in Christ along WITH the faithful believers who have remained alive unto the COMING of Jesus. Therefore since we KNOW that there is a sounding of a TRUMPET AT the time of the rapture of the church all we need to do is do a word search on the words "TRUMPET" and "TRUMP" in order to learn WHEN the rapture of the church will occur. Please read 1 Corinthians 15:48-54, which teaches us that before we can inherit the kingdom of God we must be CHANGED from being mortal to being IMMORTAL and this happens at the time of the RESURRECTION of the dead in Christ. 52. In a moment, in the twinkling of an eye, AT the LAST TRUMP: for the TRUMPET shall sound, and the dead (speaking of only the dead IN CHRIST) shall be RAISED incorruptible, and we (speaking of BOTH the newly resurrected dead in Christ along WITH those faithful believers who have remained ALIVE unto the COMING of Jesus) shall be CHANGED. 54. So when this corruptible shall have put on incorruption, and this mortal shall have put on immortality, then shall be brought to pass the saying that is written, Death is swallowed up in victory." In other words, our CHANGE is speaking of both the dead in Christ and those who are alive and remain unto the COMING of Jesus being giving ETERNAL LIFE. So then BOTH this passage of scripture AND the passage of scripture we read in 1 Thessalonians 4:13-18 are speaking of the RAPTURE of the church. Both passages of scripture speak of the sounding of the TRUMP or TRUMPET of God. And both passages of scripture speak of the RESURRECTION. The passage of scripture in 1 Thessalonians speaks of being CAUGHT UP together to meet the Lord in the air and so shall be ever be with the Lord, and this passage of scripture in 1 Corinthians 15:48-54 speaks of our CHANGE, because FLESH and BLOOD cannot inherit the kingdom of God. Therefore there will be NO catching up to be with the Lord UNTIL there is FIRST a CHANGE. In other words, BOTH of these passages of scripture are speaking of the SAME EVENT that has now been come to be called the RAPTURE of the church. I want you to notice that in 1 Corinthians 15:51-35 that this EVENT that has been come to be called the RAPTURE of the church takes place AT the LAST TRUMP or TRUMPET of God. Therefore since we KNOW without a doubt that the rapture of the church will take place AT the time when the LAST TRUMPET is sounded, then all we need do now is to let the scriptures interpret themselves in order to learn WHEN the rapture of the church will take place. In other words, the moment we determine WHEN the LAST trumpet shall sound, then we will ALSO know WHEN the rapture of the church will take place, because the rapture takes place AT the TIME when the LAST TRUMPET is sounded. With that being said let us do a word search on the word "MYSTERY" in order to see where it will lead us. Please read Revelation 10:7, where we find that the word "MYSTERY" is connected to the SOUNDING of the SEVENTH angel. "But in the days of the voice of the SEVENTH angel, WHEN he shall BEGIN to SOUND, the MYSTERY of God should be FINISHED (or accomplished), as he hath declared to his servants the prophets." Please remember and keep in mind that the RAPTURE of the church will occur AT the SOUNDING of the LAST TRUMPET of God. The word "LAST" means the FINAL one in a sequence. The word "LAST" is a very simple word that cannot be interpreted any other way than there shall be NO OTHER trumpets that shall sound AFTER this FINAL and LAST trumpet has sounded. Now letting scripture interpret scripture we learn that the are only SEVEN TRUMPETS that are to be sounded in the book of Revelation. And is Revelation 10:7 we just learned that it is AT the SOUNDING of this SEVENTH and LAST angel to sound that the MYSTERY of God is FINISHED or accomplished. The word "AT" means that on the precise moment that the LAST trumpet BEGINS to sound the MYSTERY of God, speaking of the RAPTURE of the church, should take place. And the word "BEGIN" means the same thing. In other words, BOTH of these verse are speaking of the SAME MYSTERY of God that take place AT the SOUNDING of the SEVENTH and LAST trumpet of God, and THEN the WRATH of God is poured out in this SEVENTH trumpet of God. In other words, the FIRST SIX trumpets are sounding DURING the time of GREAT tribulation, then the RAPTURE takes place at the precise moment that the SEVENTH trumpet BEGINS to SOUND to pour out the WRATH of God. Now all of this AGREES with Matthew 24:29-31, which clearly and plainly teaches us that the SECOND coming of Jesus takes place IMMEDIATELY AFTER the time of GREAT TRIBULATION. Now IF the teachings of the PRE-tribulation rapture of the church as well as the teaching of the MID-tribulation rapture were TRUE, then it we NOT be possible for the to be a SOUNDING of a TRUMPET at the SECOND COMING of Jesus, because the RAPTURE takes place WHEN the LAST trumpet of God is SOUNDED. In other words, since the word of TRUTH clearly and plainly teaches us that there will indeed be a SOUNDING of a TRUMPET at the SECOND COMING of Jesus, AND we also see a GATHERING TOGETHER of the elect from all over the world, then we MUST conclude that the RAPTURE of the church takes place AT the SECOND COMING of Jesus just BEFORE the WRATH of God is poured out. Remember that the word "LAST" clearly and plainly means that there will absolutely be NO OTHER TRUMPET that shall SOUND AFTER this FINAL trumpet, which is sound AT the time of the RAPTURE of the church. So since the CLEAR, PLAIN, and SIMPLE word of God teaches us that there will we the SOUNDING of a TRUMPET AT the SECOND COMING of Jesus, then there is NO WAY that the LAST trumpet can be sounded BEFORE the time of GREAT TRIBULATION. There can only be ONE last trumpet, just like there can only be ONE second coming of Jesus, and only ONE first resurrection where only the dead in Christ are resurrected from the dead. Please read the study called "THE GREAT TRIBULATION", which clearly shows that the RAPTURE of the church takes place at the time of the FIRST RESURRECTION. The plain and simple truth is the church will go THROUGH the time of GREAT tribulation, which is NOT the WRATH of God as many FALSELY believe. Please read the study called "THE WRATH OF GOD VERSES THE GREAT TRIBULATION" for a deeper understanding that the wrath of God is NOT poured out DURING the time of GREAT tribulation. And here is a list of other studies that prove without a doubt that the church will go THROUGH the entire period of great tribulation. Thanks for reading, May God bless you richly as you continue to seek the TRUTH of the WHOLE word of God.